Trolling for Sugar Daddies, the Democrat Women's Way to Advance! Wendy Davis, the Democratic candidate for Governor of Texas, is a Republican consultant's dream. If the woman isn’t getting her life story wrong, she is telling the world that her paraplegic opponent needs to walk a mile in her shoe. Wendy Davis is the poster politician for liberalism, and sometimes I wonder if the left truly gets the joke that is Wendy Davis. Consider her lifestyle. We are left with the impression that Ms. Davis rose from living in a trailer park to working her way through Harvard Law School all while raising her daughter. The problem is that what Ms. Davis failed to mention is that her rise from trailer park queen began when she married a nice gentleman who was 13 years her senior and a lawyer. He helped raise her daughter and they added a daughter of their own, but that was not all. He also helped her get a college degree and then supported her way through Harvard Law School. And as he paid the last bill to Harvard, she said good bye and left their daughters with him as she moved on with her career and political ambition. 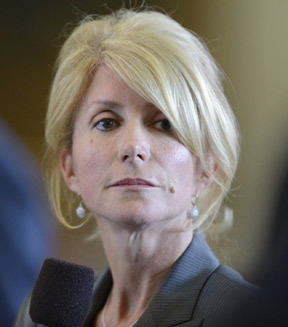 Wendy Davis, the great feminist, managed to get ahead the old fashion way; she married upward and found a sugar daddy. When she obtained her goal, she moved on with her life as she left her kids and husband behind. Wendy Davis has lived the leftist life almost to a tee. Like the fictional Julia created by the Democrats and Obama campaign, she found that having others pay her way through life worked out very well, and why not be part of the party that uses the government to be a Sugar Daddy to all of us? Davis' philosophy can be explained very simply: government is like a sugar daddy providing goodies to all and she certainly showed that marrying the right guy can be very helpful in one's career. Now I will let the feminists tell me if that is the feminist way; marry the right guy to get ahead. In viewing Davis, I am reminded of another Democratic feminist icon who married right. It begins with a love affair at Yale where a Midwest gal meets a southern gentleman, and they get married. He becomes a governor of a southern state before making the move to the Presidency. Is Hillary any different from Wendy Davis when it came to satisfying her own political ambition? Let's be blunt, if Hillary Clinton was not married to Bill Clinton, she would not have risen to the political status that she has presently risen. During her husband's first term, her failure in promoting Hillarycare, the precursor to Obamacare, nearly derailed the Clinton Presidency. Bill saved his Presidency when he simply ignored Hillary and listened to the more moderate voices within his administration. Hillary Clinton, riding the coattails of her husband, got herself elected to United States Senate from New York and after an unsuccessful Presidency run, she managed to parlay what is looking more and more everyday as a disastrous reign as Secretary of State into a resume for the Presidency. Hillary's rise to power came exclusively through her relation with her husband and like Wendy Davis, she married her political sugar daddy. So what can we conclude from modern day feminism's icons: two women who basically advanced to their present position due to marrying the right guy. I am glad Wendy Davis is running for governor for it shows the difference between the two parties in Texas. On one hand, you have a man who has overcome obstacles and became an good public servant and on the other side of the leger, you have a woman who married a man, got her degrees and then split to fulfill her ambition. Somehow feminism has been reduced to advancement by marrying a sugar daddy, turning government into one big sugar daddy for women as opposed to allowing both women and men to pursue the American dream on their hard work.